The Ultimate First Day of Summer in San Diego! Even though it feels like Summer all year round in San Diego, the 2012 season officially begins on Wednesday, June 20. To prepare for the coming of days at the beach, twilight golfing, concerts by the water, cold craft beer and sunshine; Maren and I are headed out along the coast of San Diego to experience and share with you the ultimate first day of summer. Throughout the day, the two of us will be posting pictures, trivia and giveaways on our social media channels. Make sure to follow @visitsandiego and the hashtag #sd1stday on Twitter. Like us on Facebook and check our San Diego page during the day to see what we have been up to! 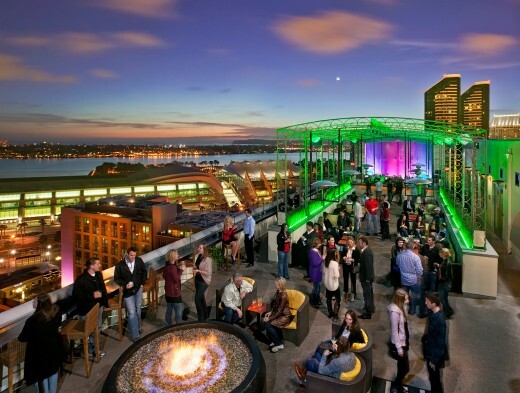 To cap off the ultimate summer day in San Diego, join us from 4:00 – 7:00 pm (the normal Happy Hour starts at 5:00 pm) at Altitude Sky Lounge atop the San Diego Marriott Gaslamp Quarter for beautiful views, good friends and great Happy Hour Specials. Make sure to join us on Twitter and Facebook and we will see you in San Diego. Happiness is Calling. This entry was posted in Attractions and tagged beach, first day, happy hour, summer by Brent Bernasconi. Bookmark the permalink. Can’t wait to join you at Altitude!! Ah so that’s what’s inside a mojito! You’re right, there is nothing better than to welcome the first day of summer with a fun activity with friends.